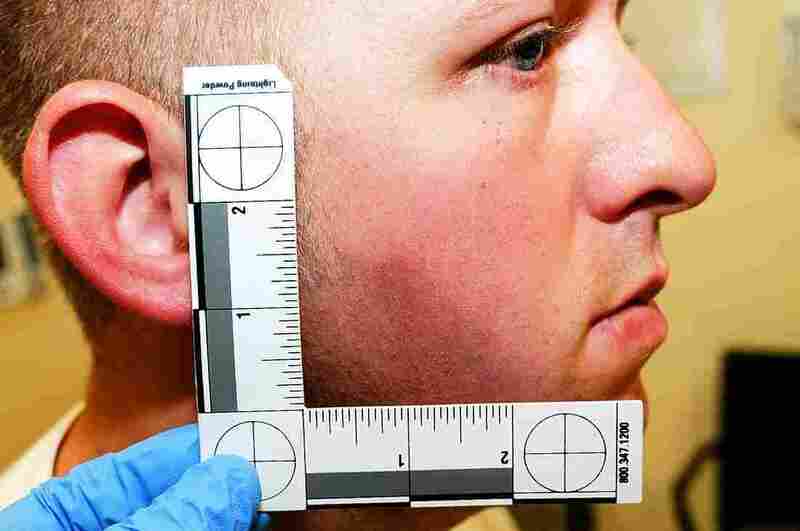 Ferguson Documents: The Physical Evidence : The Two-Way Officer Darren Wilson fired a total of 12 shots during his Aug. 9 encounter with 18-year-old Michael Brown. Of those, at least six hit Brown, killing him, evidence released Monday showed. 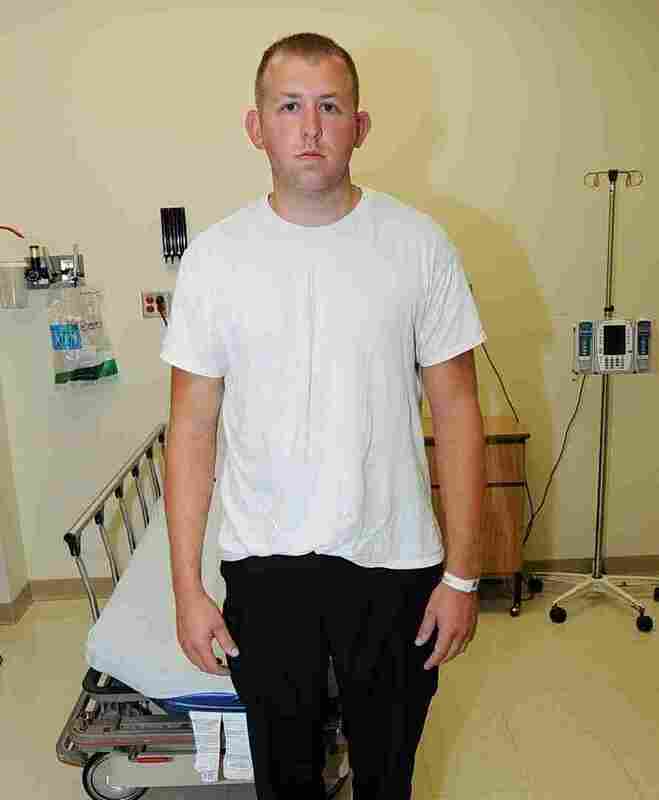 This undated photo released by the St. Louis County Prosecuting Attorney's office on Monday shows Ferguson police Officer Darren Wilson during his medical examination after he fatally shot Michael Brown. We've already touched on Officer Darren Wilson's testimony and that of the dozens of people who testified as witnesses in front of the grand jury in the shooting death of Michael Brown. 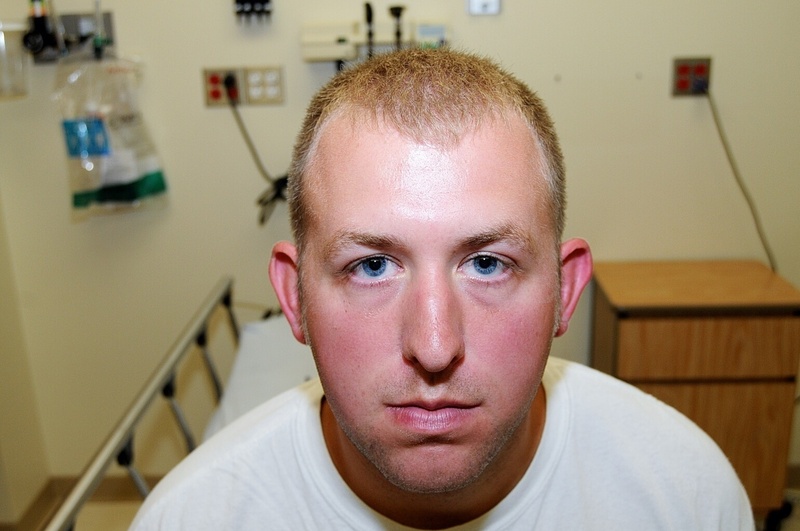 Officer Wilson fired 12 shots in all in his encounter with the 18-year-old. Of those, at least six hit Brown, killing him, according to the postmortem examination report conducted by the St. Louis County Medical Examiner. Wilson fired two shots inside the police car. One of the bullets was recovered. When the confrontation continued outside, more shots were fired. The postmortem report found a gunshot entrance wound on the vertex of Brown's scalp. There was an entrance wound in his central forehead, with a corresponding exit wound in his right jaw. Another entrance wound was in his upper right chest and one in his lateral right chest. There was an entrance wound in the upper ventral right arm, along with a corresponding exit wound on the upper dorsal right arm. There was also a gunshot entrance wound on the dorsal right forearm, along with a corresponding exit wound of the medial ventral right forearm. Brown was also grazed in his right bicep and right thumb. He also sustained injuries to his face, left hand, right chest, left forearm and left hip, along with abrasions. Investigators could not determine the order of the shots. This is all important because early witnesses had said Brown was shot in the back. Another important piece of evidence comes from DNA analysis. It revealed that Brown's blood was on Officer Wilson's gun (a Sig Sauer P229) and on the inside of his police vehicle. In order words, this seems to support Wilson's version of events, in which there was a confrontation while he was inside the police vehicle. X-rays taken at hospital showed Wilson did not have any broken bones. An exam revealed "minimal palpable pain to left mid maxillary region." The doctor who saw him diagnosed him with a "facial contusion" or "the medical term for a bruise."